The Monday after Le Touquet Camilla and I hacked Askeaton and Heidi, who’d had the week off, and Emma and Kvint had a well deserved day in the field while I went to work. Mark and I had a lovely evening with friends enjoying the fabulous views up on the South Downs above Firle where James and Louisa Butcher who run Yamp Camp have a glamping site of beautiful yurts and bell tents. On Tuesday my sister Polly came to stay with her family and their ponies on their way back to France after Pony Club Camp in Northamptonshire. We had a lovely family hack on Wednesday, and luckily the good weather mainly held out so that the children could enjoy the ponies and the swimming pool. I took Heidi and Askeaton to Felbridge on Saturday. Heidi jumped so well in the British Novice that I put her in the Discovery as well. She was a little star! Askeaton jumped very boldly round the 1.05, and she feel ready to step up to Newcomers now. It’s great that they have both come out of Hickstead and a little rest so well and seem on course for Edenbridge and Oxted and the Hickstead autumn show. On Sunday I had a very early start to take Kvint and Emma to jump the National 1.30 Championship at Stoneleigh. The last time I went to Stoneleigh was in 1998 to jump the hunt relay at the Royal Show with Mossfort, and the previous visit was in 1979 as part of the winning Grafton Pony Club Eventing team at the Pony Club Championships. The BS National Championships is a relatively new show, but I think it’s going to develop into a really good show. The surface was great and there was certainly a big show feel to the day, despite the damp weather, so I'm not planning to leave it another 19 years before my next visit. I knew the championship might be a big ask for Kvint and walking the course confirmed that. Although the first fence was 1.30 the class was table A10 meaning that it quickly stepped up to 1.40. With 90 entries and a high class field it was never going to be easy. Horses just have to jump to 1.30 double clears to qualify and as most local shows have 1.30 as their biggest class most of the good horses in Britain are qualified for this class. Kvint is always so brave and willing, but he is green at this level, and was a big course in a small spooky ring. He started a bit spooky, but jumped really well, but as he had two down I pulled him up before the last line, which was big and up against the marquees so that we didn't risk him scaring himself. Emma was 46th to go and jumped a good clear to get into the jump-off. I was 10th to go in the jump-off and there was only one clear so I was keen to nail a clear with the result that we were a bit steady with some very good combinations still to come. We finished 6th in excellent company (Faye Adams, Carron Nicol, Robert Smith, Helen Treadwell and Louise Whitaker ahead of us). We had a proper prizegiving, with music, announcer and a proper lap of honour - all things Emma finds very exciting, and then we set off for the long trip home. 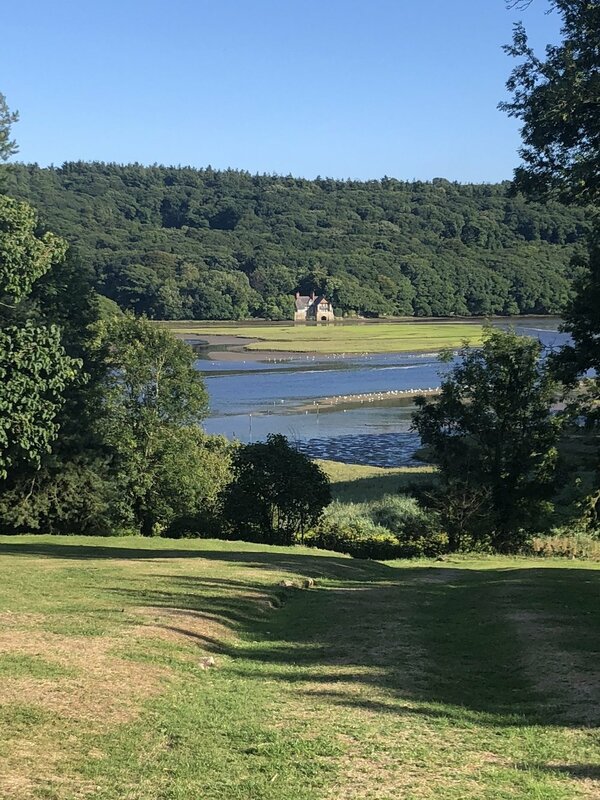 This week we have had the most blissful holiday in my most favourite place, the Flete Estate in South Devon. The estate is situated on the Erme Estuary and owned by the Mildmay-White family. My father spent a great deal of time there in World War II, we had our summer holidays there as children, and then when Anna and Sophie were little we rented one of the Coastguards Cottages. More recently we have stayed at Efford House with Sara and Richard Mildmay White. For proper seaside fun, long walks and beautiful views it is the most perfect place and I just love it there. We made quick pilgramages to Salcombe which was buzzing for the regatta and Noss Mayo for a drink at the lovely Ship Inn, but none are as lovely as Mothercombe. After a very relaxing week we arrived home this afternoon, in time for me to have a ride on Emma, Kvint and Askeaton. All felt in very good form and looked absolutely marvellous. So many, many thanks to Steff and Camilla for looking after them so well in my absence and to Saracen Feeds who definitely help make them look so well.